This year SEETEST is back to Bulgaria (SEETEST 2014 was in Bucharest, Romania) and SEETEST 2015 ended successfully, leaving new knowledge and many good memories. The organizers (SEETB and Quality House Ltd. as a co-organizer) would like to thank the speakers, the sponsors, the participants, the program committee, the supporting organizations and the media partners for making the conference one of the top events in the IT area for the South East European Region. Lee Copeland, Exploratory Testing Explained (Software Quality Engineering, USA). Erik van Veenendaal, Practical Risk – Based Testing (Improve IT Services BV, Bonaire). Clive Bates, How Good is your Testing? Check it out with TMMi (Experimentus, UK). Olivier Denoo, Should I Weigh or Should I Go – Do’s and Don’ts about Metrics (Ps_Testware, Belgium). Yaron Tsubery, Load & Performance – Practical Principles (Enghouse Interactive, Israel). Klaus Olsen, Using Scrum Methods as a Test Manager (Softwaretest.dk, Denmark). Raffi Margaliot – Deliver Amazing Apps with Confidence (HP Software, Israel). Sharing their experience and knowledge with the audience is of great use for every QA and will definitely provoke putting into practice better or even new approaches, practices and methods. Their tutorials and keynote speeches will also help for the improvement of the QA process. The Program Committee (14 members from 8 countries) has done an excellent job in the selection of the presentations for the Conference Day – special thanks for their commitment and choice! Out of over 30 paper submissions from 6 countries, i.e. 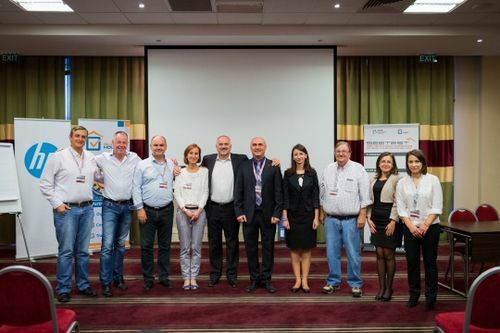 Bulgaria, Romania, Serbia, Norway, Hungary and Slovenia, the Program Committee compiled an excellent conference day program addressing a broad range of topics on software quality. The presentations they selected made us question the approaches and methods we use now. They also managed to show to all the participants in SEETEST 2015 that the QA specialists from all over the world face similar problems in their everyday work. Quality House would like to kindly thank to our sponsors for their support – HP (a Platinum Sponsor) and iSQI (a Silver Sponsor). Special gratitude to the supporting organizations – BASSCOM, BAIT, ANIS, HUSTEF, MASIT, SJSI, testerzy.pl, Vojvodina ICT Cluster, Test’RS Club, SoftUni and SEPE. Quality House appreciates very much the help of the media partners of the SEETEST 2015 – JobTiger, Computerworld and ITeventZ. Last, but not least – a big “Thank you” to all the participants in SEETEST 2015 – in the event participants from Bulgaria, Romania, Serbia, USA, Bonaire, Israel, UK, Belgium, Denmark, Hungary, Norway, Slovenia, Germany and other countries took part. Join us in Romania in 2016.